If you thought that nothing could be done to the Jaguar XK series cars to improve them further since these were already very impressive, you were wrong. Meet the 2012 Jaguar XK Artisan SE (Special Edition), which Jaguar has launched recently. 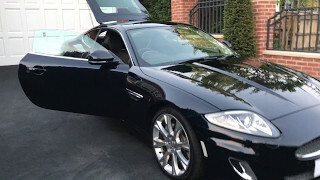 Available in both coupe and convertible variants, the 2012 Jaguar XK Artisan SE is simply style and class personified. On the outside, the XK Artisan SE is not much different from its earlier cousins. The biggest difference in appearance is probably the color it sports. The Artisan SE comes in a Celestial Black color which sets it apart from the erstwhile XK series vehicles. Apart from that two other color options have been made available - Rhodium Silver and Polaris White. The roof color in the convertible variant will either be black, grey, blue or brown. Apart from color, the Artisan SE also has new 20-inch alloy wheels to perfectly complement the exterior. There is no change as far as the powertrain is concerned. It will be powered by the same ground breaking 5000cc V8 Petrol engine that powered the previous XK models. The engine has been mated with a six-speed automatic transmission with the option of a manual driver control through steering wheel mounted paddles. But it is on the inside that the true ‘Artisan’ feature of the 2012 XK Artisan SE comes alive. A royal sense of styling has been given by the use of tactile ‘scraffito’ finished leather in combination with Poltrona Frau leather linings on the front passenger seats, doors, rear casings and the instrument console. The car will also come with 525W Bowers and Wilkins sound system, heated steering wheel, keyless entry and engine start and 16-by-16 way adjustable heated performance seats. All these are standard features of the Artisan SE. Also, all the models include a 7-inch touchscreen computer with navigation and entertainment modes. Safety features of the car include Pedestrian Contact Sensing System, which automatically raises the bonnet in the event of contact with a pedestrian to help protect contact with engine hard points. Jaguar’s own Adaptive Restraint Technology will also be seen in this model. Price of both the versions of the Artisan SE for UK has been announced. The coupe will have a price tag of 77,350 pounds, while the convertible will set you back by a whopping 82,500 pounds.